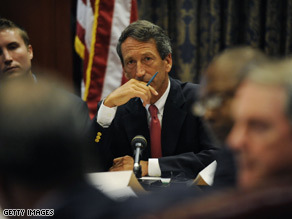 More South Carolina Republicans said Monday Sanford should step down. COLUMBIA, South Carolina (CNN) - Three more Republicans in the South Carolina state legislature spoke out against Mark Sanford on Monday and said the best thing for the governor to do in the wake of last week’s scandal is resign. At a local Chamber of Commerce breakfast in Cherokee County, GOP House members Lanny Littlejohn, Dennis Moss and Steve Moss each told the audience that Sanford has lost the credibility to steer the state’s economy through the final 18 months of his term following revelations of an extramarital affair. Reached by phone, each legislator confirmed their comments at the breakfast. All argued that Sanford has simply become too much of a distraction for the state and can no longer devote his full attention to the troubled economy. South Carolina has the third highest unemployment rate in the nation. Dennis Moss said the governor was derelict in his duty by traveling overseas without putting in place a chain of command in the case of an emergency. He also said it’s more important for Sanford to focus on being a husband and father at this time, and that his official duties in Columbia prevent him from doing so. “It just appears that his focus is not on South Carolina any longer and that it hasn’t been for the last year,” said Steve Moss - no relation to Dennis - who was endorsed by Lt. Gov. Andre Bauer in his special election race earlier this year. Bauer is in line to replace Sanford if he steps down. Republican state Rep. Greg Delleney, who has already asked for Sanford to resign, was also at the breakfast and spoke out against the governor, according to those in the room. Members of the South Carolina House have so far been more forthcoming in calling for the governor's resignation than their counterparts in the state Senate. In addition, the governor made a round of phone calls to county GOP chairmen around the state to apologize and ask them for a chance to work with him over the next 18 months to help restore the public trust, according a Republican source. Also on Monday, an anonymous Web site called “Sanford Must Go” appeared online, with corresponding Facebook and Twitter accounts. The site features a photo of the governor superimposed over a map of Argentina and a photo of his mistress, Maria Belen Chapur. Anti-Sanford sentiment is also set to play out in the public eye next week. Glenn McCall - one of South Carolina’s three Republican National Committee members - told CNN that he and other conservative activists are organizing a rally for Wednesday or Thursday at the State House in Columbia to demand Sanford’s resignation. McCall said he has lined up nearly 400 people ready to attend the rally. McCall said the event is being organized, in part, because not enough Republican leaders in the legislature have publicly called for Sanford to step down. “There is no leadership out of our Republican majorities in the House and the Senate, so we have to go down to the State House steps and have a rally,” he said. Last week, McCall became the first elected Republican official in the state to ask Sanford to resign. He said his sentiment reflects the will of the grassroots activists in his native York County who believe that Sanford has betrayed Republican values by cheating on his wife. Come on now. Leave the poor hypocrite alone. He still believes in Jesus, and that frees him from any accountablity. At least that's what I think this stuff is all about. i'm wondering why Ensign and Vitter, the kings of hypocrisy that they are, have been allowed to skate and Sanford gets busted? I don't really care 4 the man myself and he should resign he left the people of sc with no one 2 look out 4 us if something happened that tells me he cares more about the other woman the he dose the people of sc.that's way he was upset about loseing the stimulus battle because he need the money 2 pay off what he took from taxpayer it wasn't 2 pay off our debt.he need 2 go back 2 the other women and let the people of sc go with our lives.